Further development of Richelieu with changed main gun turrets arrangement. The ship was ordered in 1940 but never laid down. There isn’t any information if Gascogne will be a regular or premium Tier VIII battleship. All stats are listed without crew and upgrade modifiers, and are subject to change before the final release. 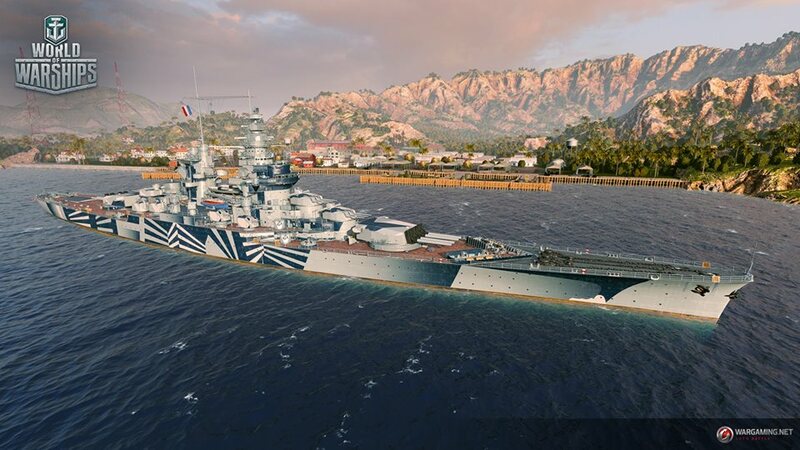 Judging by the camo, it might be a premium ship. It will be the premium ship. Due to the turret-arrangement, it’s the odd one out of the bunch, which means it gets moved out of the regular tree. Technically, Richelieu is the odd one out. The entire line up until this point has had majority firepower that can only be brought to bare by showing broadside. Even the tier 9, the Alsace has an emphasis on this with it’s traditional three turret placement and I strongly suspect the tier 10 will be the same as Alsace. But yes, this will be a premium. It would be fool-hardy for wargaming to not have the more renowned vessel in the line. Technically they could make it a side-grade. Two alternative T8s. Yes indeed, techtree ships do not get good looking camos.